Mrs. Gordon was born and raised on Manhattan’s Upper East Side, the daughter of James A. and Helen McIntyre. Her father was the general sales manager of the Marmon Motor Car Company, one of a number of luxury automobile companies that fell victim to the Great Depression. With college no longer an option, the beautiful seventeen-year-old Elinor found a job modeling through the John Robert Powers Modeling Agency, and began to appear in Vogue and Ha rper’s Bazaar. In January 1939, at the age of twenty-one, she was pictured on the cover Life in the Alfred Eisenstaedt photograph shown here. During World War II Elinor met and married Horace William Gordon, a graduate of the University of Pennsylvania and the Wharton Business School, who was at the time an aide to General Albert C. Wedemeyer at the Pentagon. From the beginning theirs was an exceptionally felicitous union. Shortly after their marriage in 1943, Horace took his twenty-five-year-old bride on her first buying trip for China trade porcelain, from Otto Wassermann; when she became a “compulsive collector,” she made many purchases from the famed J. A. Lloyd Hyde, whose New York shop was on Sixtieth Street between Madison and Park Avenues. She went into business on her own in Philadelphia in 1953, at the age of thirty-five. In hindsight, the 1950s were the golden age of American antiques: it opened with the launching of the annual Williamsburg Antiques Forum in 1949 (a joint venture between Colonial Williamsburg and The Magazine ANTIQUES) and the opening of the Winterthur Museum, Garden, and Library in 1951, and closed with Jacqueline Kennedy refurnishing the White House with American antiques. In between, many of the major annual antiques shows and fairs—Boston, New York, and Philadelphia—were begun; and new auction records were being reached at New York’s Parke-Bernet Galleries (in particular, the Norvin H. Green Sale of 1950) and elsewhere. It was during this period that Elinor Gordon began to participate in as many as eight antiques shows a year—from the Lake Forest Academy Antiques Show north of Chicago to the Theta Charity Antiques Show in Houston, as well as all the major ones along the eastern seaboard. It was a brutal schedule, but she maintained it over the decades, to the eternal gratitude of numerous collectors. She assisted Pamela C. Copeland of Wilmington, Delaware, in forming her collection of animal figures—”Oriental porcelain frivolities” now in the Peabody-Essex Museum of Salem (see ANTIQUES, May 1966); she directed Euchlin and Louise Reeves in putting together the collection of China trade porcelain now at Washington and Lee University (see ANTIQUES, October 1973); and H. Richard Dietrich sought her advice in forming his China trade porcelain collection, now in the Diplomatic Reception Rooms of the Department of State in Washington (see ANTIQUES, July 1987). 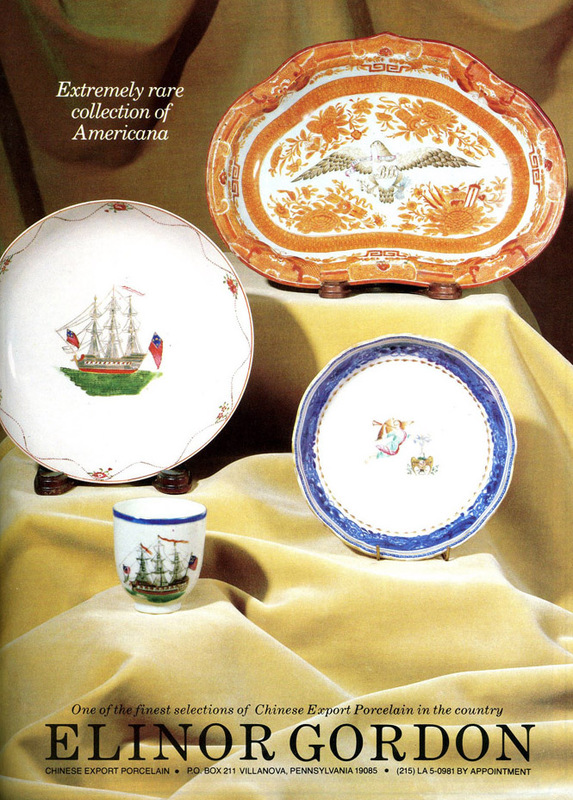 But the dealer Elinor Gordon never lost her passion for research and scholarship: among other publications, in 1974 she selected and edited a compilation of articles from ANTIQUES under the title Chinese Export Porcelain: An Historical Survey (1975). Horace Gordon supported his wife completely in her chosen career. Theirs remained one of the happiest and gentlest marriages of true partners I have ever known. Without fanfare, in a quiet way and over a long life, Elinor Gordon helped more people, promoted more noble causes, and sustained more fragile spirits than many of us have known, giving of herself with grace and concern. She was elegant and eloquent—as the portrait by Eisenstaedt shows her—formidable of intellect, dry of wit, and warm of heart.